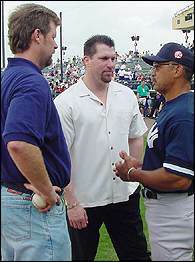 Rob Dibble joined ESPN as an ESPN Radio host in June 1999. His primary role is on The Dan Patrick Show, which debuted September 13, 1999 and is heard Monday-Friday 1-4 p.m. ET. He had been co-host of GameDay on ESPN Radio (4-7 p.m. weekdays). Rob hangin' out with Rick Sutcliffe and Reggie Jackson during spring training in Orlando. Dibble will also appear on Baseball Tonight, and serve as analyst on select Major League Baseball on ESPN Radio games. Dibble, a seven-year Major League Baseball veteran, previously worked as a radio host and a baseball analyst for ESPN and ESPN Radio in June 1998. A right-handed pitcher, Dibble retired from baseball in 1995. He had a 27-25 record with 89 saves and a 2.98 ERA in seven major league seasons with the Cincinnati Reds, Chicago White Sox and Milwaukee Brewers. He struck out 645 batters in 477 career innings. Dibble combined with Norm Charlton and Randy Myers to form the "Nasty Boys" bullpen which helped Cincinnati win the 1990 World Series in which he tossed 4-2/3 scoreless innings in three appearances against the Oakland A's. In the playoffs that season, he was named co-MVP of the National League Championship Series for hurling five scoreless innings against the Pittsburgh Pirates, striking out 10 and picking up a save. Dibble had his finest major league season in 1991 when he saved 31 games for the Reds. He was named to the National League All-Star team in 1990 and 1991. In 1997 he served as studio baseball analyst for Fox Sports. When not providing his insight taking calls, Dibble enjoys many outdoor activities such as hunting, fishing and playing golf. His other hobbies include Tang Su Do, a form of Karate, and playing the drums. Born January 24, 1964, Dibble is married with two children.